From Chula Vista RV Resort, Chula Vista, California On Tuesday afternoon, March 15, I cut carrots and nothing happened. That got my attention. Ozzie jumped down from the couch but Lexie didn't come and she didn't bark. That's odd. Lexie and Ozzie love carrots. He always jumps and she always barks. I pointed this phenomenon out to Wayne. We both were perplexed. Next day, Wednesday, Lexie's unusual behavior continued. We kept an close eye on her and saw she just wasn't right. She avoided going up her steps to the sofa. By nightfall, she had begun to move away from us when we tried to touch her. None of us slept well that night. Thursday morning, March 17, I began research for a veterinarian and by noon, the four of us (Wayne, Lexie, Ozzie and I) were at South Bay Animal Hospital in Chula Vista. 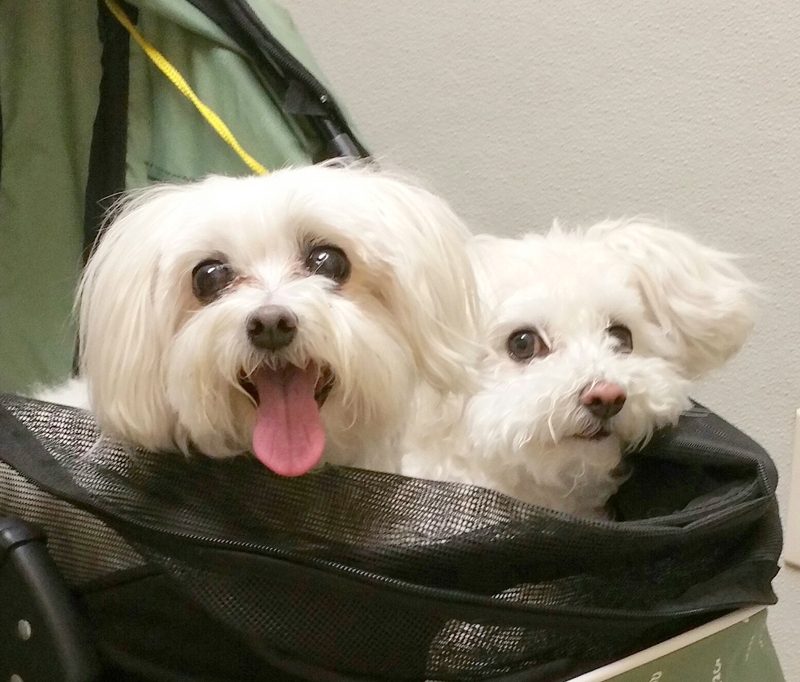 Lexie (left), her sweet face disguises a little dog in pain. When one goes to the vet, we all go. All for one and one for all. Ozzie, on the left, is always apprehensive. Dr. Jagpal Deo listened to our explanation of Lexie's behavior and examined her, noting that her abdomen felt abnormally hard. Her appetite, bowel and urine habits were normal. 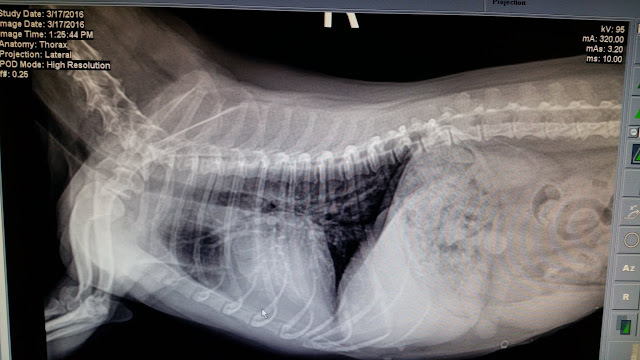 X-rays were taken and the Dr. Deo reviewed them with us noting that nothing really seemed unusual. He asked our permission to do bloodwork. We agreed. From the side. Lexie's head is to the left. Looking down on Lexie's back. Her head is to the right. Thursday morning, Dr. Deo called with the results of Lexie's bloodwork, reporting that everything looked normal here too except her Gobulin, which was 4.6 (normal is 1.6 to 3.6). He suggested that we proceed with getting an ultrasound done the following Monday afternoon when a mobile unit would be at his hospital. A specialist could review the ultrasound and all the other data we had to that point. We agreed of course. He suggested we stop by the office for Tramadol to manage Lexie's pain over the weekend. But by Friday night, worried sick, Wayne and I agreed we would get Lexie into the local Emergency Pet and Specialty Center to have the ultrasound done sooner than Monday. By 9 a.m. Saturday we were meeting with Dr. Virginia Fritsch, reviewing Dr. Deo's x-rays and blood work. Lexie stayed at the hospital all day and was transported, via pet ambulance, to the hospital's La Mesa location to have the ultrasound. She was given intravenous pain medication during her stay. Wayne, Ozzie and I returned to the coach and waited on tenterhooks. Around 5 p.m., Dr. Fritsch called to advise us that the ultrasound was underway. At 7 she called again to tell us that there were no conclusive issues and the best diagnosis they had was a possible kidney infection. A test for pancreatitis was performed and culture for urinary tract infection (UTI) was taken but results will take a few days. Lexie was dismissed up around 9 p.m.Saturday night and we brought her home in a very groggy state. The night was terrible as she seemed scared and unable to rest but in little or no pain. We continued giving her the Tramadol and now added Clavamox for the suspected infection. We watched and waited but our old Lexie just wasn't there. On Monday, pancreatitis was ruled out. Waiting just for the UTI test result now, we were hopeful to see a bit of progress but did not. On Tuesday afternoon, Lexie had to make a return trip to Dr. Deo when her back legs were so wobbly Wayne and I feared she was losing her ability to walk. Dr. Deo examined Lexie again. 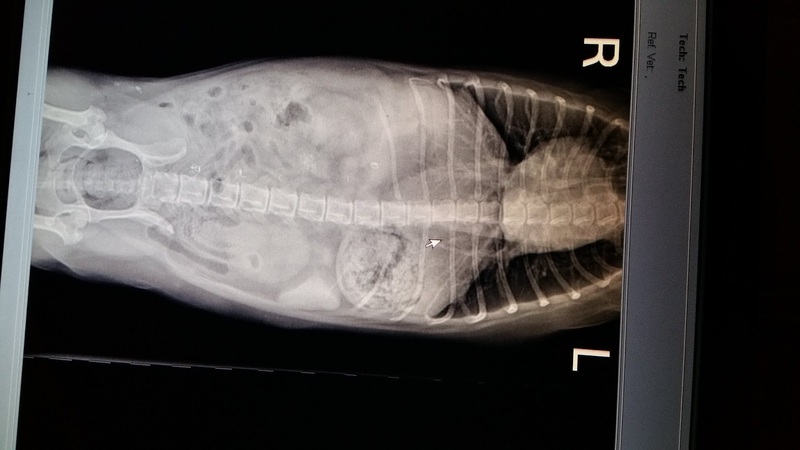 After a few minutes he told us that the reported weak and wobbly legs indicated that Lexie's problem was likely due to pain in her back, legs or hips even though she didn't cry out when physically examined. 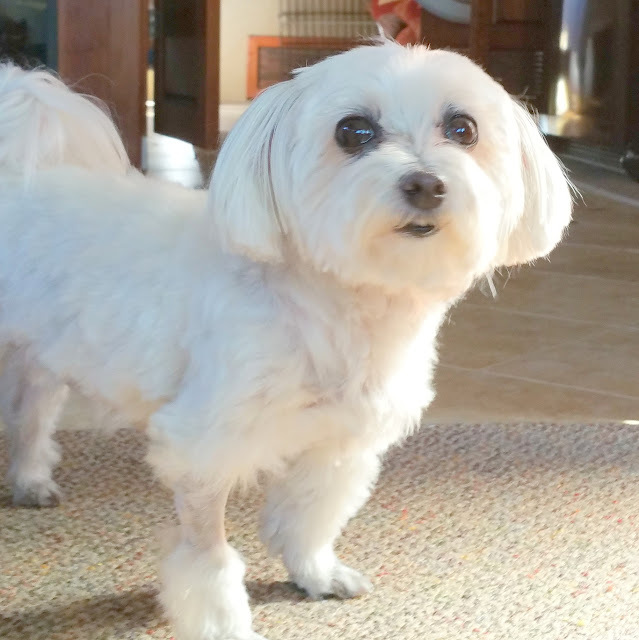 A puppymill dog with Lexie's neuroses is especially careful to mask signs of weakness or pain. Pain and inflammation explain the high Globulin level too. Dr. Deo prescribed a two week steroid (prednisone) treatment. We finished the Clavamox and gaveTramadol for a few more days. Dr. Deo was right. Within days, our sweet little Lexie was back to herself. 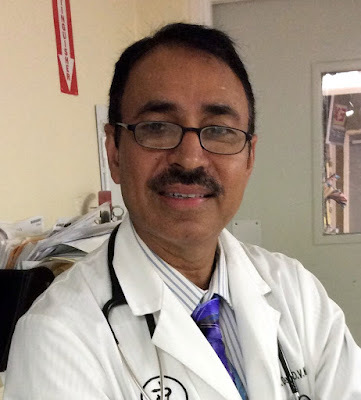 We returned to the clinic and her abdomen had softened -- that made Dr. Deo feel good. Us too. Lexie was released from his care and continued to improve. A shaved tummy and front leg were required for the ultrasound and the IV. She may have Intervertebral disc disease (IVDD) which is what our Scooter suffers from. Scooter was actually unable to use her back legs for a couple of months and she's still kind of shaky now but is back to bouncing around most of the time. If you want lots of good information check out www.dodgerslist.com. They have been a lifesaver for us. I am so glad Lexie is feeling better again. They are just so precious. Thanks for the informational link. I'll check into it. And thanks for the well-wishes. Our girl is nearly back to normal again but I fear this is what you've suggested and might return.